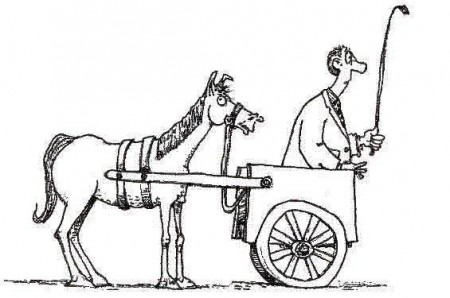 Periodization: Why we don't 'put the cart before the horse'. Helgerud et al., 2007 showed a significantly greater (7.2%) increase in VO2max in athletes performing 4min intervals at 95% of max HR than a group of athletes performing the same amount of total work at 70% HRmax. 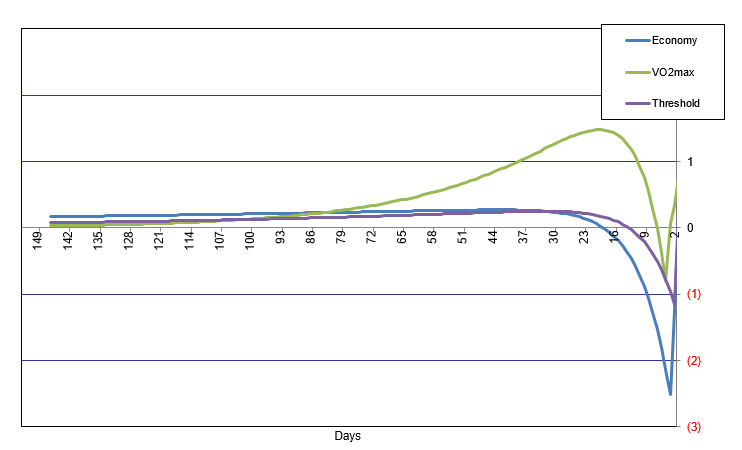 In this case, this represented a bump of 4ml/kg/min in 8 weeks of training! However, these studies aren’t terribly applicable to an athlete training over a full year, & even less so for the athlete training year after year in search of Maximal Athletic Development. There is no doubt about it, over a short period of time, a high intensity, low volume approach can ‘sharpen’ the athlete and improve short markers of performance at an impressive rate – a rate far beyond that of base training. This is a fact that has been known and exploited by World Class endurance coaches in 'peaking' an athlete for a major competition for many years. The dynamics (and impact!) of this approach are shown in the chart from Osler (1967) below. However, as the chart also shows, this adaptation is transient and when an athlete elects to ‘sharpen’ they give up a good chunk of their base (F1/F2). This is something that the serious athlete can ill afford to do and certainly can’t afford to do it months away from their most important competition of the year! No, the sensible coach/athlete isn’t going to structure their periodization phases ‘willy-nilly’ There is a reason for the sequencing of the various types of training in traditional periodization that can’t be argued with. This optimal sequencing ties into a key physiological metric: The time course of training adaptations. 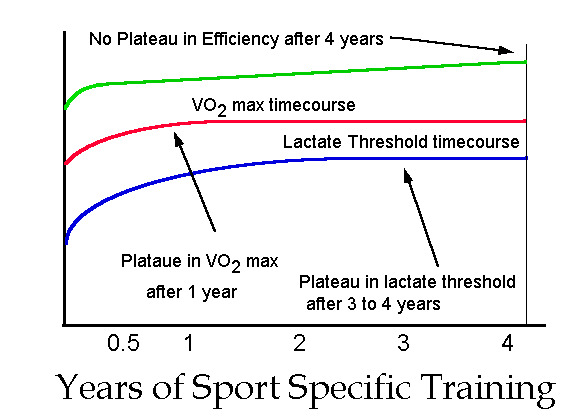 These differences in the time course of training adaptations are shown on the chart below. The flipside of these differences in the time course of training adaptations is in the rate at which these capacities detrain, i.e. VO2max is lost quickly in the absence of specific training. Threshold is lost a little more slowly &, finally, aerobic economy is a persistent adaptation, with elevated economy numbers seen in former elite athletes after several years removed from the sport! When we apply these differences to the training year, it has direct implications on the sequencing of training. For instance, if VO2max is important to our event and we know it is lost quickly, it would make sense to place it closer to the event (lest we do a block of hard VO2max training 6 months out that is completely lost by the time our event rolls around!). On the other extreme, given that economy is such a persistent quality, we can afford to place it a good ways from the target event knowing that at the slow rate at which it erodes, some will still be present when we arrive at our target event. Indeed, if we look at typical rates of detraining for the various physiological qualities, we can pinpoint the optimal time for sequencing a block of training designed to improve that quality. This is the concept of influence curves – curves which show the peak time at which a given type of training will have the most direct benefit to competition performance. If we look at a chart that superimposes the influence curves of the various qualities upon one another, the rationale for traditional periodization becomes clear. It is clear from the chart above that ‘sharpening’ training – the type of training designed to elicit the maximal changes in VO2max has the most positive impact ~16-70 days (2-10 weeks) before the event. Threshold training tends to have the greatest positive impact 4-16 weeks before the target event &, any time prior to that, training designed around improving aerobic economy leads the way. These time frames tie in very well with what elite coaches have been doing for years in the realm of endurance sport. 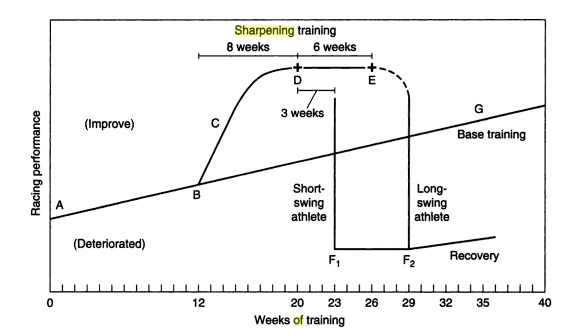 Of course, there are differences in both sport and individual to consider that may impact the duration and magnitude of emphasis during these phases, however, the sequencing, according to the time course of training adaptations shouldn’t be messed with. What does this mean, for you, the serious athlete with 3 foot of snow outside your front door? Take a cue from those athletes who have an even more boring indoor proposition to contend with – elite rowers. In the words of someone who knows Winter – former elite row coach for the Swiss Olympic team, Marty Aitken “use the Winter to give the athletes a break from the tedium of hour and hours of steady state rowing by incorporating cross-training.” Marty’s rowers deal with the 3 foot of snow by grabbing some skis and heading out the door! For his athletes, in the Winter months, more than 50% of training comes from cross-training activities – skiing and cycling. By incorporating this strategy, he finds that his athletes improve their aerobic base (lower lactate levels when they return to erg training) &, just as importantly, improve their durability by balancing out the row-specific muscle groups prone to over-development. This Winter, don’t let your cabin fever push you over the edge into making irrational decisions that will have a negative impact on your long term aerobic base, your key racing performance, and even your health!